Microsoft Accelerator, a global program built to empower startups and Wipro Limited, a leading information technology, consulting and business process services company have entered into a partnership that will provide startups with greater opportunities to innovate and grow their business. This announcement was made at the accelerator’s flagship event - Think Next 2016 that brings together thought leaders who are driving transformation via innovation. Think Next 2016 also marked the graduation of 13 startups from its ninth cohort. 13 startups, Whodat, Betaout, MovenSync, Transaction Analysts, AllizHealth, Uncanny Vision, Meddiff, FarEye, Epictions, Germin8, Talview, Faircent and Surukam, graduated from the accelerator’s ninth cohort and were introduced to an audience of more than 550 corporates, investors, thought leaders, and Microsoft management who partnered to push the collaborative innovation. Almost all these are backing on advanced technologies like Artificial Intelligence, Machine Learning and Internet of Things (IoT) to scale up. Wipro’s Open Innovation philosophy strives to bring together and partner with key stakeholders such as startups, academia, expert networks, Venture Capitalists, Incubators/Accelerators and Technology Consortia in the external ecosystem in order to deliver business value to Wipro, its partners and customers. “Microsoft Accelerator #CoInnovate program bridges the gap between corporates and startups. Connecting startups to corporates and crafting a win-win relationship is a critical need of the ecosystem today. 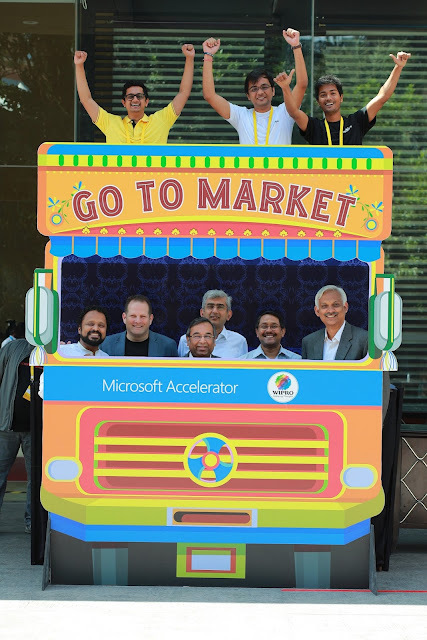 The partnership with Wipro allows us to leverage our combined strengths and market reach to provide a whole new level of market access for our startups.” said Bala Girisaballa, CEO-In-Residence, Microsoft Accelerator. Bala mentioned that many of the portfolio startups, including CustomerXPS, CloudCherry, Zing HR, Altizon System and iBOT have seen great traction from Microsoft’s ISV Program and the accelerator’s corporate partnerships. Through this partnership, enterprises stand to gain from access to the innovative technology solutions emerging from some of the best technology startups in the country. In addition, they will get a robust technology solution backed by the reliable delivery and support platform provided by Microsoft and Wipro. 13 startups, Whodat, Betaout, MovenSync, Transaction Analysts, AllizHealth, Uncanny Vision, Meddiff, FarEye, Epictions, Germin8, Talview, Faircent and Surukam, graduated from the accelerator’s ninth cohort and were introduced to an audience of more than 550 corporates, investors, thought leaders, and Microsoft management who partnered to push the collaborative innovation. 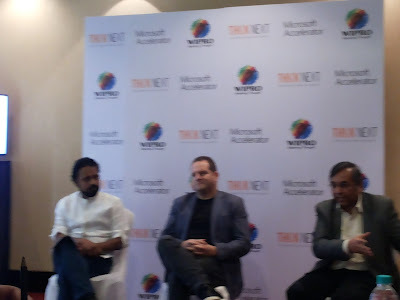 The event also had Microsoft leaders, Judson Althoff (Executive Vice President, Worldwide Commercial Business, Microsoft Corporation) and Tzahi ‘Zack’ Weisfeld (General Manager, Microsoft Accelerator) addressing the audience on developments in the global technology and startup ecosystem. At the Think Next Panel - Transforming Tomorrow Together, Althoff, along with Aftab Mathur (Director, Temasek) and K.R. Sanjiv (Senior Vice President and Chief Technology Officer, Wipro Limited) and Balaji Suryanarayana (Co-founder, CustomerXPS) discussed the significance of enterprise-startup partnerships in the process of digital transformation. Microsoft also hosted the third edition of ‘All India Accelerators & Incubators Meet’ bringing together 35+ accelerators and incubation partners to drive greater impact to enable and empower the startups. At the Think Next Panel, an impressive panel of speakers - Sharad Sharma from industry think tank iSPIRT, VCs Shekhar Kirani, (Accel Partners) and Samir Kumar (Inventus Capital), serial entrepreneur, K Ganesh, and Microsoft Accelerator alum, Aditya Sood, Sr. Director Engineering and Products, Nutanix deliberated on one of the most critical questions in the startup ecosystem – Why Go Global? and talked about the potential of India as a market for growth. Before the main event, Microsoft presented a highly curated set of startups to a select audience of investors, CMOs and Ecommerce businesses in a VC Speed Dating and two Market Access Programs. Bala also mentioned that Microsoft Accelerator is currently accepting applications for its 10th cohort, which is scheduled to start in February 2017.